Shiny Objects showcases the work of New York based artist John LaMacchia — A diverse collection of photographic and sculptural work exploring themes of mass consumption, perception, deception and the fluidity between high and low cultures. 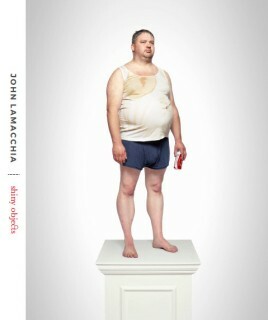 Shiny Objects showcases the work of New York based artist John LaMacchia. The book brings together a diverse group of photographic and sculptural work. LaMacchia, who is known for his C-prints of everyday individuals or objects distilled from their natural habitats, scrutinizes the fixated dynamics of contemporary routine as well as the fluidity between high and low cultures. Employing firsthand sarcasm as a utilitarian tool, the artist dismantles mediocre perceptions imposed by consumerist narrative and prevalent media. John LaMacchia (b.1973, New York) received his BFA in Advertising and Graphic Design at The Fashion Institute of Technology. He started his career as an art director winning awards around the world including those at Cannes and an Emmy nomination. John LaMacchia has worked alongside the likes of Robert DeNiro, Martin Scorsese and Errol Morris. LaMacchia began his investigation into the art world using similar techniques found in advertising, shortly building a cohesive body of work that explores basic themes of mass consumption and human perception. LaMacchia’s artist books and prints are available at Printed Matter. He lives and works in New York and New Jersey.